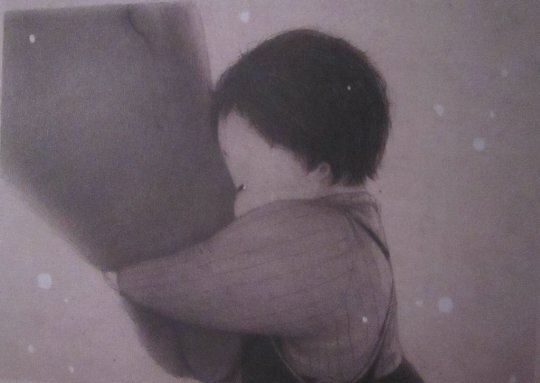 This picture book uses the simplest of materials - pencil and paper. There are no words, but there is definitely a story, one to take time over, linger in each spread to follow the tale. 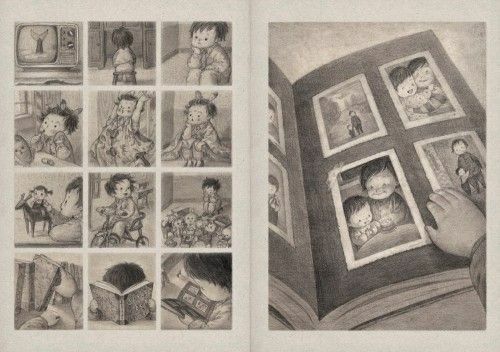 The story is cleverly paced through the arrangement of the images; a stellar moment captured with a single image in a double page spread, a romping playtime captured in nine little pictures in a grid on a single page. The small chubby-cheeked child (could be male or female, I'll settle for he) is left alone when the mother goes to work. At first he is happily entertained with pencil and paper and a small toy reindeer. After a look through the family photo album he decides to catch the bus to go and visit Grandma. The journey goes awry when he falls asleep on the bus then runs into the trees in a panic. But it's here that the magic starts with a large stag (a real version of the toy) who comes to the rescue and carries the child up a stairway into the clouds where he makes another friend - a soft round seal-like creature. There's an exciting encounter with a whale - I love the totally black double-page spread while they are inside before being whooshed out the blow-hole. Meanwhile the mother has come home and we see a note - 'gone to visit grandma'. The mother is panicked and searches for him. 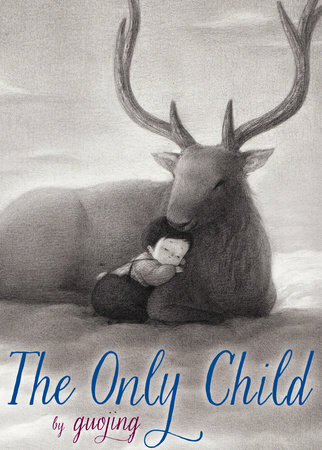 They are finally reunited in the last pages after the child is delivered to the grandparents' house by the stag, with a touching moment to be lingered over as they child and stag say good bye. 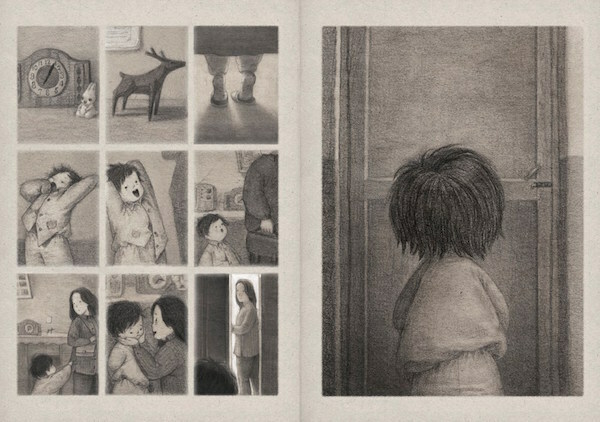 I was reminded of the Shaun Tan masterpiece The Arrival, particularly with the use of the grid of images and related photograph album. This is a quiet masterpiece to whisper and dream over, and imagine what might come to life in your own version of this dream-like tale with no words. 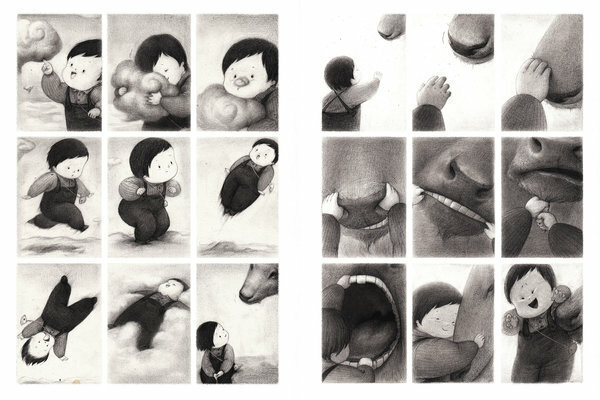 The dreaminess is reinforced with the softness of the pencil and the chubbiness of child, seal critter, clouds etc. A great pathway to discussions about what to do when you are lost too. A substantial book too, no mere 32-page picture book here, but graphic novel, and based on a true event in her childhood, getting lost on her way to her grandmother's house. 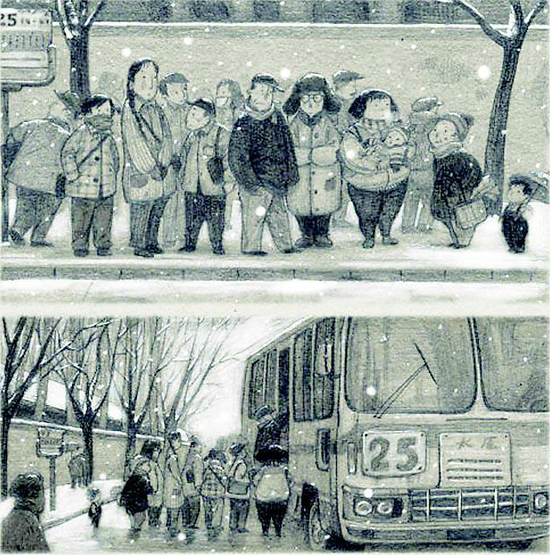 This book has gathered a slew of awards - take a look at Guojing [aka Jing Guo]'s website. She is an illustrator and concept artist who previously worked in the animation and game industry.